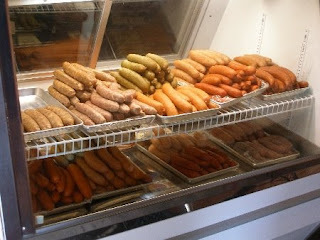 What Is This, a Freaking Sausage Fest in Here?! Since I've been hanging out with straight guys lately, I've been unconsciously adopting their lingo and mannerisms, and I must say that I'm currently doing a stellar job at keeping heterosexual male obnoxiousness alive and well in the 21st century—much better than my attempt at ending every sentence with "brah" last year, a personal inside joke that was pretty much lost on everyone aside from myself. Lately, whenever I walk into a party or a bar that is comprised of more desperately single men than desperately single women, I exclaim with indignation, "What is this, a freaking sausage fest in here?!" That comment gets me high-fives because I am vocalizing collective thoughts, giving voice to the pent-up frustrations of an entire group of people. Hey, it's what I do. 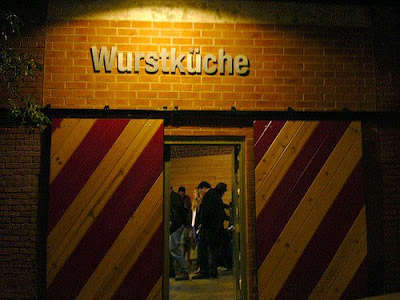 On Saturday, Loren took me to a restaurant called Wurstküche in downtown Los Angeles. PRINCE: What is this, a freaking sausage fest in here?! Though there's usually a line that goes out the door during peak hours, Loren loves this place and says you should opt for the rattlesnake over the alligator, if you are indeed a risk taker. I chose the vegetarian Italian sausage on my first visit, and it's yummy. And for all you lushes, there are a couple dozen imported beers on tap. For sweet innocent boys like me, there are gourmet sodas—hello, strawberry soda, I love you! 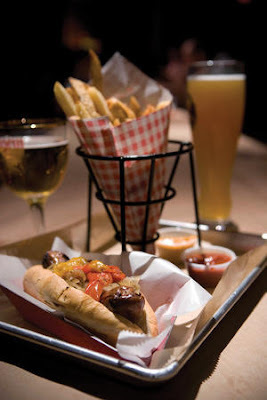 Check out the Wurstküche website and menu. BAMBOO NATION: What Is This, a Freaking Sausage Fest in Here? !